Polish authorities have criticized the deputy prime minister's remark on Ukraine‘s disintegrating economy, calling it “unfair.” Janusz Piechocinski painted a black scenario for the country gripped by hyperinflation and currency plunge. "These signals which are coming from Ukraine are very disturbing, because the economy there is beginning to disintegrate, economic ties are beginning to disintegrate," Piechocinskisaidin an interview to Reuters released on Tuesday. According to the deputy PM, Poland risks facing a huge influx of migrants from crisis-stricken Ukraine. "In a black scenario of developments in Ukraine, one cannot exclude an inflow of a few hundred thousand emigrants to Poland. Looking at what has happened during the last year, one has to take into account all scenarios and be ready," he said. The Ukrainian elite have made disappointing progress in creating a Western-style democracy, Piechocinski believes. However, Polish authorities didn’t entirely welcome Piechocinski’s statement, saying his position towards Ukraine was “unfair,”according to Polish media. “This is the opinion of Mr. Deputy Prime Minister, he has the right to such opinions, but we see positive steps in these difficult times [in Ukraine],” said Poland’s government spokeswoman, Malgorzata Kidawa-Blonska. “We will support this country so that positive processes take place there as soon as possible,” she added. The country’s Prime Minister Ewa Kopacz also criticized her colleague for his ‘Ukrainian crisis’ statement. Polish Foreign Minister Grzegorz Schetyna added that Piechocinski should think twice before making remarks on foreign policy. "Because one can help here, or cause a lot of damage," Schetyna told Poland’s broadcaster TVN24. "I think that one has to be very careful in regards to words and not allow oneself to be played by the Russian media machine, which at the moment has increased its influence in Poland,” added Polish parliament speaker Radoslaw Sikorski. Ukraine is now trying to save its collapsing economy from hyperinflation, with official numbers showing prices are rising by 28.5 percent in annual terms. However, separate research by Johns Hopkins Professor Steve Hanke suggests the real inflation rate is 272 percent, the world’s highest, and well above Venezuela’s 127 percent rate. 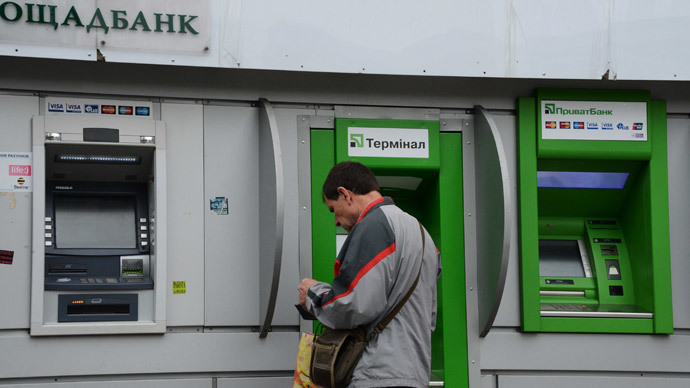 The domestic currency, the hryvnia, has lost about 70 percent since the start of the Maidan unrest nearly a year ago. The country’s National Bank is raising its benchmark interest rate to 30 percent from 19.5 percent, the biggest increase in 15 years. Kiev has recently agreed tough austerity package to gain $17.5 billion IMF bailout. The changes also see a cut in pensions for retired people by 15 percent. Moreover, pension payments for people working in the tax, customs and regulatory bodies, will be suspended. The IMF is expected to approve the new aid package to Ukraine on March 11, 2015. Ukraine is running out of the Russian gas it prepaid for in December, as the so-called 'winter package' expires at the end of March. Last week Russia warned Kiev that if it fails to make new advance payments, its gas supplies would stop this week. Since the start of military crackdown on Donetsk and Lugansk Regions in April, Ukraine has lost access to one of its economically developed regions rich in coal reserves. The regions also saw massive decrease in the workforce, with people either fleeing the violence or joining the militias. Amid the economic problems Ukraine announced a six-fold increase in military spending, which would reach an all-time record in 2015. Kiev says the money would be spent to reform its army to fight what it claims is a “Russian intervention” in eastern Ukraine.